I love flapjacks - they're easy to make, and when you do make them you can knock up quite a big batch that will see you all through the week; in lunchboxes, snacks and for little desserts for the kids. You can add choc chips, nuts, seeds or dried fruit to them - but I love to sprinkle in some frozen berries. They add moisture and sweetness and a burst of colour. I usually sprinkle sesame seeds over any flapjack I make to add crunch. This recipe makes quite moist, chewy flapjacks - if you like them more brittle, just cook it for a bit longer or push into a wider tin, so they end up thinner. 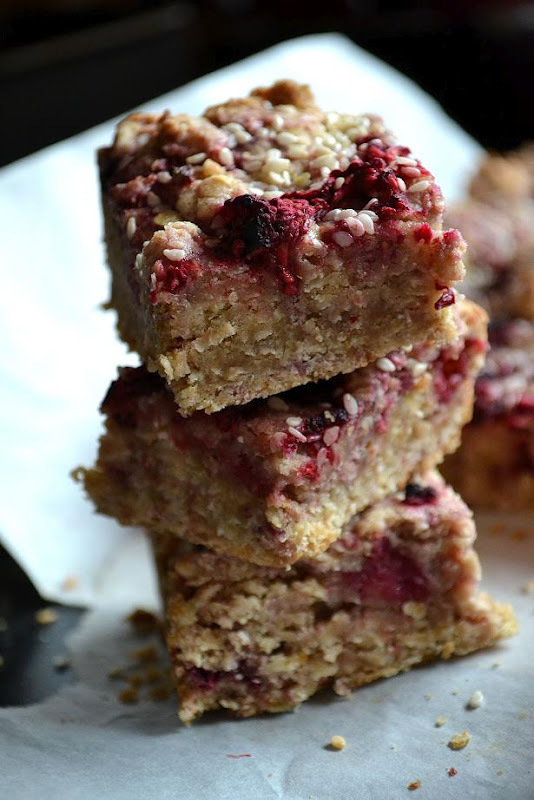 You can use whatever frozen berries you have handy - I bet they'll be lovely with blueberries, too - but these raspberry ones are great with a cup of coffee. Preheat your oven to 180°C, and line a 23cm square tin with greaseproof paper. Next, melt the butter in a saucepan and trickle in the golden syrup. Stir to combine and put to one side. Tip the dry ingredients (not the raspberries) into a large mixing bowl and mix lightly together. Save a small handful of the frozen raspberries and tip the rest into the bowl, stirring gently until they are all mixed in. Pour in the melted butter and syrup mixture and stir until all the dry ingredients are coated in the butter. Press the flapjack mixture gently into the lined tin and use your hands to give it an even surface. Sprinkle over the remaining frozen raspberries, breaking them up as you go, and then scatter over the sesame seeds. Bake in the oven for 25-30 minutes, or until golden brown and cooked to your liking. 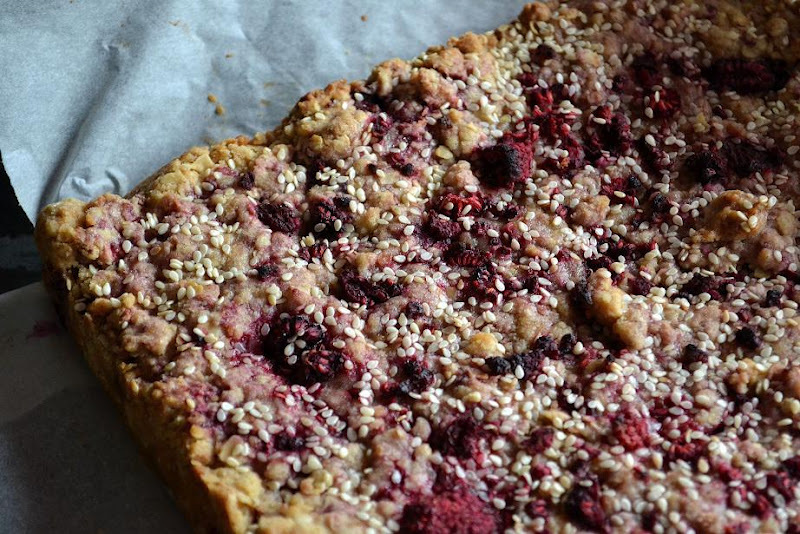 Do you have any favourite flapjack recipes? What do you add to yours?